How would it be to mix up both in-house series, the medieval fantasy shooters (The Mahou games) and the industrial line up (Battle Garegga i.E) ? 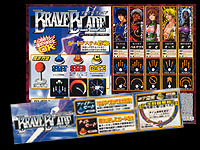 That must have been the basic idea in the Raizing / Eighting headquarters when they planned 'Brave Blade', their latest shooter game. Well, they did it, and they even changed the hardware once more. This time it's Sony's ZN system board, on which games like Raystorm and Strider 2 have been released by other companies before. This board is basically a Sony Playstation with more RAM and slightly more power. In Brave Blade we control a Dimahoo-like ship that is able to transform itself into a knight. So we get from shooting to slayin just by using the second button instead of the first one. The [C] button turns you into an invincible super-knight, able to slay the enemies much more effective, but only for a limited time. For Brave Blade, Raizing created five brand new characters. Each one comes with it's own ship / knight. The stages are labeled strangely in this game. So we start "above 'DIRT', the frontline base of the north country, and after defeating the boss "Gunhead Golem" we continue our journey by following "the moon tower" elevator into the earth's orbit. Stage three, the skies above the great channel Kress is one of the more impressive stages in Brave Blade. Like in Giga Wing 2 some really big battle ships pass by, partially covered by clouds. Brave Blade is in 2.5 D. This means all ships and vehicles are made of 3D polygon graphics, but the gameplay is still the one of a 2D vertical scrolling shooter game. Some bosses' animations look impressive when they move and transform. This is definitely an advantage of the polygon technology. Unfortunately Raizing used the possabilites of camera movements barely. A few short turns just for giving evidence of a 3rd dimension is not good enough in my opinion. Furthermore, the graphics look somewhat out-dated for a game of the year 2000. Just compare them with Taito's Raystorm, which ran on the same type of hardware - four years earlier. Nevertheless, Brave Blade has it's innovations, and they show up when it comes to gameplay. More of this on 'items & scores'.